As the temperatures warm, the season for home improvement draws near. As cold as it may seem right now in Brampton, ON, we will be well into the summer months before we know it (pause for applause)!Summer is beautiful in Canada, isn’t it? The greenery, the sky, the nightlife and early sunrises. For many Brampton residents, the pending summer months mean upcoming patio evenings with friends, glasses of wine while the sun sets, gardening, and backyard cookouts. That said, the perfect backdrop to a beautiful summer night at home on the patio or deck is a beautiful patio door from Brock Doors and Windows. But, before choosing your patio doors in Brampton, Ontario, here are some tips from our team here at Brock! First, decide where your patio doors will or could go. I mention this because patio doors are not solely for off-kitchen patios leading to the backyard. You can put them anywhere! Wouldn’t it be dreamy to have two beautiful French doors off the backside of your master bedroom? What about the upstairs deck? Or: indoors, dividing the living room from the den or four-season-porch. It’s up to you! Do you have tons of extra space? Use it. With extra space there are many options—you have your pick: large doors, small doors, double or single doors. If you have a smaller space, however, it is important to be aware of your limitations so you aren’t unhappy with the fit. Be mindful of your layout, wall placement, furniture placement, etc. Our team at Brock can help you with this through modifications and suggestions. Note: doors can be installed to open outward or inward. Whether you have a small space or a large one, the best option will always be to choose the widest door that will work for the strongest connection to the outdoors. The glass is a major component of patio doors; so, you will want to choose the best. At Brock Doors and Windows, we can help you choose what makes sense for your home: Low-E glass (for lower energy bills all year and protection against UV damage and fading), decorative tempered glass (for added charm and privacy), internal blinds (also for added privacy and sunlight control). These days, vinyl is as affordable as it is beautiful and energy efficient. Look into different designs and colors that match your décor and rest assured your money is working for you. Further, you will want to ensure whichever patio door you choose matches the exterior of your home (and we are happy to help with this!). 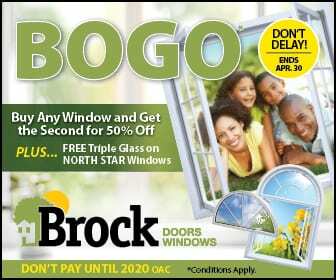 At Brock Doors & Windows, we want Brampton residents informed, pleased, and excited about the next home renovation we do together! Questions about our patio doors? Give a call! We’ll be more than happy to go over your options and to work within your budget for the most beautiful, energy efficient patio door for your home. We look forward to meeting you!